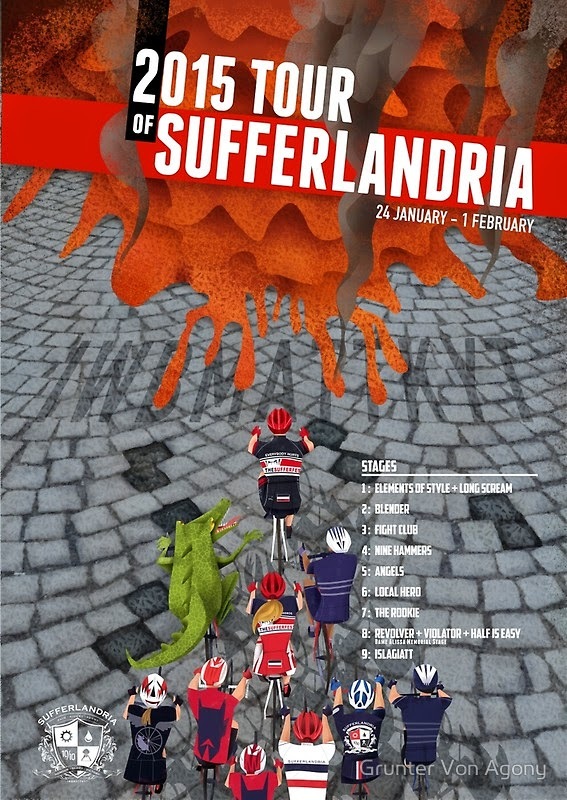 Seems that in all the Audax activity, I totally forgot to make any mention of this year’s Tour of Sufferlandria. The formula was pretty much identical to the past two years – 9 stages over 9 days. As before, I opted to participate using Trainer Road to keep me honest and track my progress through the tour. I had added most of these to my library already when released, but had yet to ride any of them. As a creature of habit, it’s easy to get stuck riding old favourites rather than experimenting with new videos especially when pressed for time. So the 2015 tour presented a perfect opportunity to give them a try. Another obvious difference was the tour start – no FTP test this year to establish the required level of punishment. Following that was what seemed like a very untypical series of straightforward stages with just 1 video per day. The sequence of Nine Hammers, Local Hero, and The Rookie did however present plenty of tough riding. The real sting was in the tail though, or close to the tail at least. The queen stage on day 8 involved 3 sprint videos totaling 2 hrs and 25 minutes of high intensity suffering. It was no less brutal in practice than it looked on paper. After 7 days straight of training, it was a real slog. I started with the goal to try and get through at least the first one or two videos at 100%, with some leeway to ease up on the third if needed. In the end, I was foolishly pleased with myself at surviving the whole set without lowering the bar. Luckily, after the 8th day beating I had two days of camping before tackling Stage 8. The 50 hour time window allowed me to do Stage 8 at lunchtime on Friday, and complete Stage 9 when home on Sunday evening. It was definitely a kinder option on the body, but it was not an easy option for the mind. After a relaxing weekend kicking back with family, drinking beers, and generally not doing much it was a battle to get back on the trainer again to finish the tour. To be honest, I almost didn’t. I don’t recall what motivated me – possibly just plain stubbornness wanting to finish what I started. Anyhow, I climbed back on the trainer and span it out. It was sweaty, grueling, and I fell short of the power targets on a couple of sprints. But overall, it was a decent effort and I was happy to have completed my 3rd straight tour. The real benefit, as I discovered in previous years, doesn’t appear immediately but comes out gradually over the next few weeks. With some recovery and easier rides to rest the body, the legs bounce back stronger and faster than ever. It’s too early to say whether I’ll do next year’s tour, but in all probability I will. In the end, they’re a fun way of pushing one’s limits at just the right time of year.